Compiled by Tammy Yee, a children's book author and illustrator. From My Hawaii: A little corner of paradise. Space Weather updates from Windows to the Universe. Hawaii's First Online News Source. Take a virtual field trip to islands of Hawaii. From the Aloha Friends website, numerous galleries depicting the landscape of various islands as well as plants and animals. These photos show not only the beauty of Hawaii, but also its culture. Compiled by Hawaii School Reports. This is the official website by the National Park Service. Links to cultural sites on Kauai's official website. Compiled by the Hawaii Coral Reef Network. Article from Wikipedia, the free encyclopedia. The stories of Pele and her family. 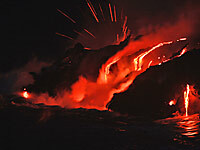 Article with photos from Volcano World. Describes the undergraduate program at Hawaii Pacific University. From Wayfinders: A Pacific Odyssey. Answers to questions provided by the Department of Geology and Geophysics at the University of Hawaii. Great recipes, decorating ideas, and activities for a wonderful Hawaiian event. This page was last updated on December 13, 2005.